Read 2 times. Last read February 27, 2019 to February 28, 2019. Ok the fact that I'm rereading this exactly five years later fills my heart with a circular sort of satisfaction. Also this reread confirms the fact to me that my brain wiped this entire book lmao, I remembered...nothing. This is my reread before diving into King of Scars and I'm very glad I decided to tackle a full reread instead of finding recaps. Mate, my memory. Have u seen it. I have not. I still have such soft fond feelings for this. Alina has a sharp little mouth on her and I forgot how much I enjoy her humble sass. Mal is still a slightly ugly pebble. At some point I'm just waiting to care about the Darkling but yet. ¯\_(ツ)_/¯ I also took a bit more time to absorb the setting and felt I saw the world better this time. (Still have to say the last 100 pages...were so...boring. At some point fantasy books have to lay down their pride at the dinner table and admit to us all that excessive walking scenes are d u l l.
I loved it. I did! Everything was fabulous: writing, setting, uniqueness, feels-inducing, swoon worthy villains characters. So why is it missing a star? When the crunch came, I wasn't worried because I knew everything would work out. It didn't feel like a risk-taking story. I was pretty sure about this: all the characters that I'd grown to love and pat would be okay. Setting? The world devoured me. Everyone spoke in a modern way, it clearly had a Russian flair, and I loved that. Although I didn't "picture" the Shadow Fold very well. I'm still not 100% sure what it is. A big splotch of darkness with man-eating pterodactyls swooping around. Characters? They are the best of the best! Alina is the narrator. She's just fabulous! A little bit of sarcasm, lack of self confidence, and true power that lies within (blah blah. She was just awesomely real and well-written, okay?). She has feelings and makes mistakes and weird jokes and fails. Mal is her best-friend since childhood (a.k.a they want to loooove each other but they don't know if they should). He's funny and a little bit THICK SKULLED. But I like him. Genya? I really liked Genya! She's the queen's "pet"...bitter but such a confident sass. She's also a perfect example of an excellent secondary character. And we have to spare a word for Darkling. I don't want to give too much away: but...I spent a lot of time shipping him (quietly) with Alina, even though I figured he couldn't be the best person for her with Mal lingering in the background. He is epically written. The world was really intricate and detailed! I loved how the author had gone the extra mile to create a unique world...but with snippets of Russian heritage. (Loooove.) Not every detail of the world is explained either. Which is the best part! I hate pages of "explanations". We just melded into the world as we read. I'm thoroughly impressed how Shadow and Bone is full of magic and medieval fantasy (and Russian food) and fantastic characters. It mixed some fresh and some old, and made an incomparable book. 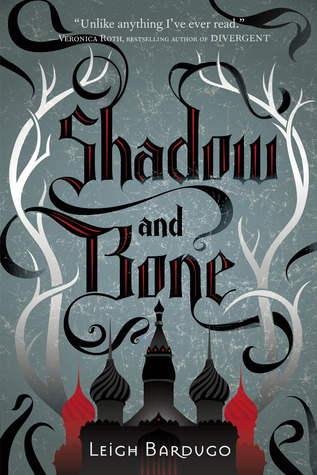 Sign into Goodreads to see if any of your friends have read Shadow and Bone. “It's probably for the best, I told myself. How would I have said goodbye to Mal anyway? Thanks for being my best friend and making my life bearable. Oh, and sorry I fell in love with you for a while there. Make sure to write! I whirled, peering into the gloom. The Darkling's voice seemed to float out of the shadows. He walked down to the stream, crouching on the bank to splash water on his face and through his dark hair. 'Well?' he asked, looking up at me. "I'm not used to people trying to kill me." 18.16% "I haven't read this since 2014...no wonder I remember like 3% of it. 😂 ok trilogy reread and then KING OF SCARS HERE I COME"
Get on to the next book -- скорее!! I just lent these to a friend who adored them and then I was like, "ha, now you are in the same boat as the rest of us, desperately waiting for book three." i just read the 2nd book and i loved that just as much as the first! The second is my favourite of the series!